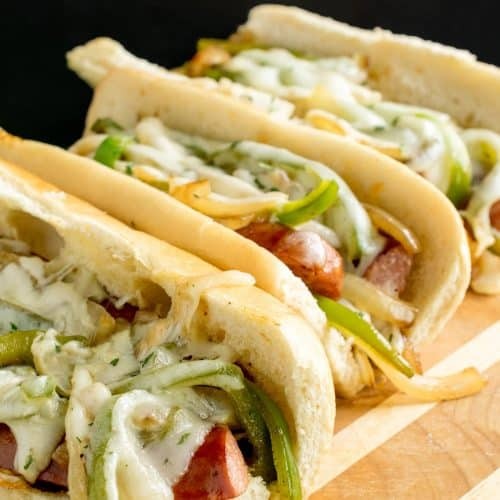 Our tailgating food tradition, these kielbasa sausages with onions and peppers are served up on hoagie rolls. Simple to clean up and packed with flavor, they may be you next lucky charm. Heat skillet over medium heat. Add oil, onions, peppers, and seasonings. Cook about 4 minutes and add Kielbasa link. Toss occasionally until onions are translucent and sausage is heated through, about 10 more minutes. Cut kielbasa to appropriate length and add to sandwich. Top with onions and peppers and provolone cheese slices. Serve with mustard and other condiments. This can be done using a skillet or foil pan over a grill. The recipe can also be completed at home on the stove with a skillet.